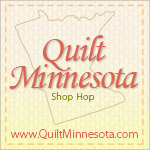 Gathering Friends Quilt Shop uses the US Postal Service to ship all of our orders. Shipping on orders over $150 is free in the continental US. Alaska, Hawaii and international rates will vary. Gathering Friends’ works hard to ensure you’re happy with every purchase. Unfortunately, items in our catalog are non-returnable. If you received the wrong item(s) or are unsure if an item is returnable, please call (320) 365-4670 or email us to talk with one of our staff members.